This tapestry, "The forest of Clairmarais II" shows a French verdure scene of a forest. Verdures became a movement of tapestry art on its own in the 16th and 17th centuries as the new science of botany attracted attention of artists as well as scientists. Filled with oak, hornbeam, beech and elm, The forest of Clairmarais continues to be a much revered place to hike to this day. The famous Harchelles pond, as seen here, 7.5 acres in size, is the last of seven ponds dug by monks from the nearby abbey. In this verdure, one can imagine the stream in the middle leading to one of these ponds, just out of sight. Here we see the shoreline is lined with trees in all shades of green and golds, complementing the crystal blue waters of the stream, to create a cohesive and harmonious use of color. 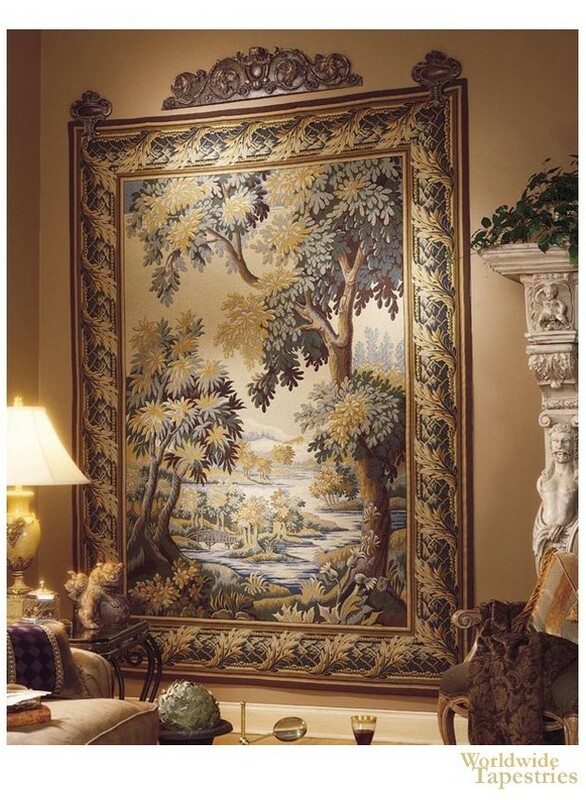 This is a hallmark signature of verdure tapestries from France. This verdure tapestry "The forest of Clairmarais II" is lined and comes with a tunnel for easy hanging and display in your home. Note: tapestry rod, tassels and accessories, if pictured, are not included in the price. Dimensions: W 47" x H 79"